Our bread is made from the most seasonal and locally-sourced or foraged ingredients, fresh each and every day. Each loaf is hand-rolled and individual in character and is produced using extended proving periods all of which will ensure that each bite will leave you wanting more. Established in 1985, Bath Bakery has an enthusiastic team working in the bakery, across five retail sites, and in three vans delivering to wholesale customers, such as Cafes, Hotels, Delicatessens, Pubs, Hospitals,Schools, Catering Companies, Nursing Homes, Farm Shops, Clubs, in Bath and beyond. 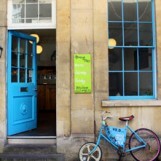 Bartlett & Sons Family Butchers are traditional butchers based in Bath, covering the surrounding area. We have been established since 1931. We get our meat locally to ensure the quality and use no chemicals or additives to artificially enhance our meats. Producers of Award Winning Real Somerset Cider and Fresh Apple Juice. As a way of saying Thank-You, we’ve decided to freeze our online prices into 2011 for all of our Ciders and Fruit Juices. So you can enjoy Somerset’s Secret wherever you are in the UK. We hope you find everything you need here, however if you’re thirsty to know more, please do not hesitate to get in touch with us. As you browse through our piggy website you’ll be able to find out why we do what we do and why we hope you will love what we do as much as we do! If that isn’t a big enough mouthful for you to chew on, then you just wait until you try our incredibly moorish (OK Spanish-ish) BRITISH Chorizo! Wing of St Mawes Fish Merchant buy fresh fish, shellfish and seafood daily for delivery nationwide. From the fish markets of Newlyn, Plymouth, Looe and Brixham in Cornwall and Devon, our daily selection includes Turbot, live Lobster, Dover Sole, Red Mullet, Monkfish, John Dory, diver caught Scallops, Wild Mussels and live Crab, all delivered daily to our customers, fresh from the quayside – we only buy the best! Wing deliver fresh seafood to hotels, restaurants, pubs, schools, retail shops, farm shops, delicatessens, nursing homes and fishmongers, we pride ourselves on providing fresh fish, shell fish and smoked fish with, quality, reliability and value for money and good old-fashioned service. Fresh food wholesales for the catering throughout the South West. At Burton’s Go Bananas Ltd, we supply and deliver fresh food to catering and retail customers throughout the South West of England. We specialise in providing dry goods as well as fresh fruit and vegetables and also have the facilities to deliver frozen food. Our temperature controlled distribution vehicles ensure your goods are delivered in excellent condition. All our products are of the highest quality delivered in refrigerated vans from our chilled premises in Clutton N. Somerset. Bacon from Somerset can be sliced to your requirements, and as our range shows we supply many different cuts. All our cheeses are from local Somerset producers. The range of cooked meats is from the highest quality products incorporating our continental range. Our finest hams are traditionally cured and cooked in Devon. Eggsel was established in1992 to provide top quality eggs from farms local to our customers, which comprise of, schools, bakers, caterers, shops and restaurants together with a large number of hotels.